WASHINGTON, D.C. – The Navy isn’t moving fast enough to fix the ongoing systemic physiological episodes that have plagued fighter pilots and flight students, members of the House Armed Services Committee said on Tuesday. The number of physiological episodes suffered by pilots has been on the rise over the last ten years, and the Navy was forced to deal with the issue in April 2017, when a group of more than 100 Navy pilot instructors refused to fly the T-45C Goshawk trainer aircraft due to safety concerns. Since then, the House Armed Services tactical air and land forces subcommittee has held several hearings but remains dissatisfied with the progress on solving the PE problem, chairman Rep. Michael Turner (R-Ohio) said on Tuesday. “This has got to be fixed. I don’t have confidence that we’re getting nearer to that,” Turner said. 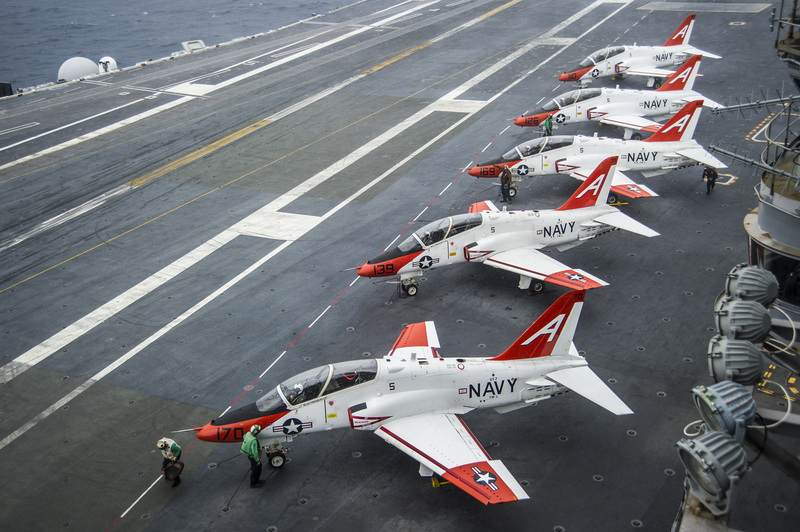 In response, the head of the Navy Physiological Episode Action Team (PEAT) Rear Adm. Sara Joyner told the subcommittee the Navy has brought its T-45 trainer fleet back to full pilot production levels with the installation of CRU-123 solid-state oxygen monitoring units. The units alert the aircrew if oxygen pressure falls and allows them more time to take corrective action to prevent a PE. “We are very carefully trying to put that training to the max capacity,” Joyner told USNI News following the hearing. While pilot production is improving, the Navy is still wrestling with PE issues on its fleet of F/A-18 Hornet and Super Hornet fighters and the EA-18G Growler electronic attack aircraft. As a measure of oversight, Congress ordered an independent NASA report that was released in December to evaluate the Navy’s effort to combat the PE problems in the Hornets and Growlers. The report was critical of how the Navy focused on trying to find a mechanical defect in the aircraft rather than involve the Navy’s medical community or pay more attention to the human element of the problem. “Although the Navy has put significant effort into investigating the physiologic episodes, the bulk of their efforts to date have been directed to the aircraft rather than human physiology,” Clinton Cragg, the principal engineer of the NASA Engineering Safety Center who over saw the report, told the panel. Last summer the Navy created Joyner’s current job as a way to ensure the service was holistically looking at the problem from all angles. Whereas the Navy had some success on the material side — now-retired former commander of Naval Air Systems Command Vice Adm. Mike Shoemaker said in the fall that PEs were down significantly after making changes to the OBOGS — the Navy realized the human side was more complex that leaders realized, with factors like hydration and sleep levels contributing to some pilots experiencing PEs in flight conditions where other pilots would experience no symptoms at all. The efforts for the Hornets, Super Hornets and the Growlers are directed at preventing failures in the two systems related to the two general groups of PEs – those caused by failures of the ”Onboard Oxygen Generation Systems (OBOGS) or pilot breathing gas, and those caused by problems in the Environmental Control Systems (ECS), i.e. – unscheduled pressure changes in the flight station,” according to the service. Joyner outlined a series of steps the service has undertaken to address both the OBOGS and ECS maintenance as well as planned overhauls for the systems on the Hornets, Super Hornets and Growlers. In addition, based on NASA report recommendations, the Navy is installing more precise monitoring equipment to gauge pilot breathing for more accurate data. Still, the effort has several technical challenges: for example, the older designs of the legacy Hornets built in the early 1980s are on paper and on microfiche in the vaults of manufacturer Boeing. While the company is assisting in the effort, Joyner said gathering the material was slow going but the service was committed to the effort. “This will remain our top safety priority until we fully understand, and have mitigated, all possible PE causal factors. Fleet awareness is high, confidence in their platforms and our processes are improving, protocols are in place and we are focused on mitigating risk, correcting known deficiencies,” Joyner said.